Redeem your extra 7 days of trial. Join for freeNo credit card required. UX is a team sport. Co‑design and get feedback. In real time. Create interactive wireframes and user flows in minutes. Experiment with 1000s of built-in elements for web, mobile, and desktop products. Build static or interactive designs with the editor, or import files from Sketch and Photoshop. Craft lifelike prototypes with advanced states and interactions. With UXPin, my productivity and developer productivity have both increased. They love collaborating and creating powerful UX without code. With UXPin prototypes, we no longer follow lengthy upfront sprints with detailed specs. We can now support a fully Agile process moving us to MVP much faster. Standardize your design system with custom libraries. 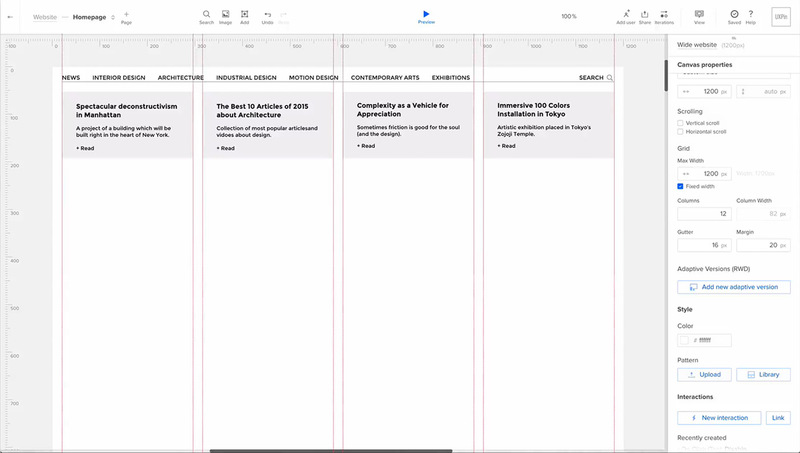 Create contextual documentation with annotated prototypes. Eliminate redundancy: modify one common element, and changes update everywhere. One of the biggest challenges in omni-channel design is ensuring your UX works across platforms. UXPin solves this problem for our team, making it simple to test our products earlier. UXPin saves us hundreds of hours of product development by simplifying collaboration. Plus, with its great library of components, I can literally go in, cut and paste a component into my design, and we’re off and running. Comment directly on designs and notify anyone. Validate concepts with built-in usability testing. Get to the bottom line with formal stakeholder and manager approvals. UXPin lets me confidently tell my team that I can validate a design in a few days. I prototype on Monday, test it Tuesday and Wednesday, and show results by Thursday. UXPin has brought measurable ROI to our company. With the platform, our process visibility has doubled and we've cut our time to market in half. Create fully documented designs for developers. Eliminates time-consuming redlining of mockups with our spec mode. Involve the right person at the right time with clear roles and permissions. Track the status of each project in the dashboard. Customize your workflow with editable status. Before UXPin, alignment could take weeks. Once I used UXPin to demonstrate a vision for the experience, I could get approval in days. Our team loves the speed and ease of use of UXPin when prototyping. We save so much time when collaborating with developers and other teams across different continents.